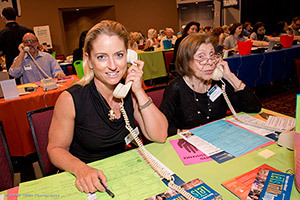 On April 2, hundreds of volunteers made sure the phones rang out once again from the Jewish Federation of South Palm Beach County throughout the Boca Raton, Delray Beach and Highland Beach areas. And hundreds more assembled kosher meal kits for distribution to neighbors in need as part of the international Good Deeds Day. 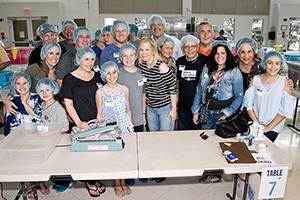 By the end of the amazing day of community spirit chaired by Talia and Hal Klein, this vibrant, diverse Jewish community had raised $576,758 from 570 donors, and packaged 20,000 wholesome, easily prepared meals kits. Even the very youngest volunteers prepared for Passover with PJ Library mitzvah craft projects to brighten the holiday for clients of the Jacobson Family Food pantry. 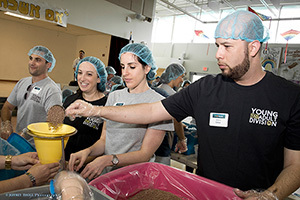 From first-timers to those with decades of Super Sunday experience, volunteers from all stages of life made calls in three shifts, many with friends and colleagues from a school or agency, AEPi Fraternity at FAU, or neighbors from a country club. Raffle prizes, selfies, meals, snacks, high energy, great camaraderie and being joined by Congressman Ted Deutch made the day fun and fast-moving. PJ Library® in South Palm Beach County families like Penina and Aron Schoenfeld and their three children enjoyed the opportunity to engage in such a meaningful project along with other Jewish families who also receive free PJ Library (ages 6 months - 8 years) or PJ Our WayTM (ages 9-11) books at home every month. Both PJ Library and PJ Our Way were sponsors of the Good Deeds Day activity. “PJ programs like today’s provide hands-on reinforcement for the Jewish values shared in the books,” said Aron. Charne and Paul Sherman came from across the street, where they live at Toby & Leon Cooperman Sinai Residences of Boca Raton, right on the Federation campus. “We were so glad for the opportunity to come over and lend a hand,” said Paul.